When we last left Erased de Kooning Drawing, the late, great Leo Steinberg had finally told his story about getting Rauschenberg on the phone in 1957 in order to sort the damn thing out. Steinberg’s conclusion was that, far from a “Neo-Dada” prank or Oedipal negation, Rauschenberg had offered de Kooning “a sort of collaboration” of erasure. The plausibility of this interpretation was inspired by the equally collaborative combine painting of the same period, Short Circuit. So to recap quickly: EdKD is a collaborative work. In which erasure-as-drawing is the subject, or the strategy. Each artist with his different markmaking method. And it is inscribed, labeled, by hand, with a flatly descriptive title and claim of authorship. 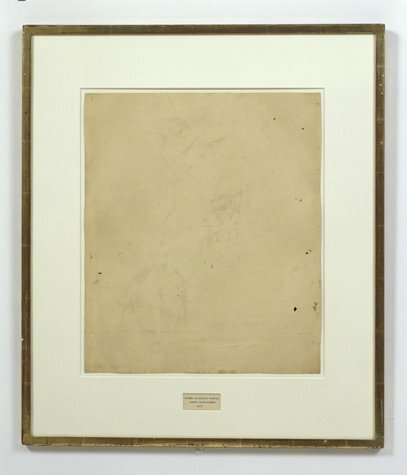 And though it had been unmatted at some point [above] rendering the inscription and the drawing as one collaged work, it was matted in a way that obscured this unity, and it was [eventually] presented as a framed, presented object. A conceptual work, realized. A concept of a drawing erased. Hold all that in your head. Am I missing anything? 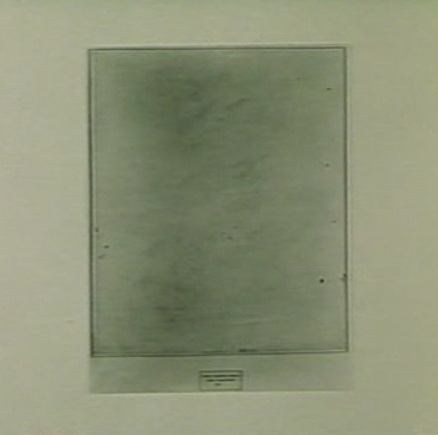 Anything besides the small detail that the inscription, the text, the third instantiation of the concept, the generative inverse of the erased drawing itself, was made by Jasper Johns? For the crucial period of EdKD‘s uptake into the art world’s discourse, Rauschenberg had always claimed that he had written the inscription. That he’d “signed” it. That’s what he told Emile de Antonio on top of that ladder. That’s the only way anyone talked about it. But it is not true. 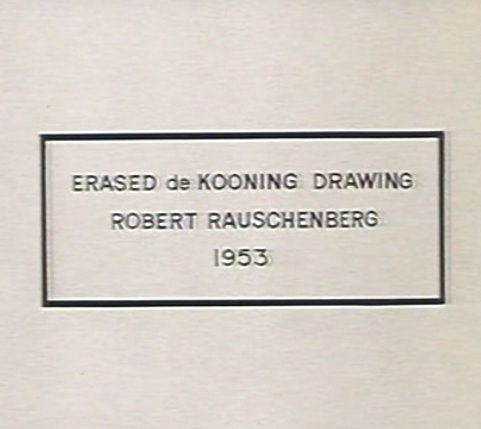 Johns gave Rauschenberg the title for “Erased de Kooning Drawing,” which came into being in 1953, when Rauschenberg persuaded de Kooning to give him a drawing which he would then erase, to see whether a work of art could be created by the technique of erasure; Johns also did the precise lettering for the title, on the framed matte below the very faint, wraithlike ghost of the erased image. The title, of course, is not on the matte, but under it. It was originally of a piece with the drawing, until the matte separated it, demoted it, even. Which may intensify the implications of difference between pre- and post-matted drawing. 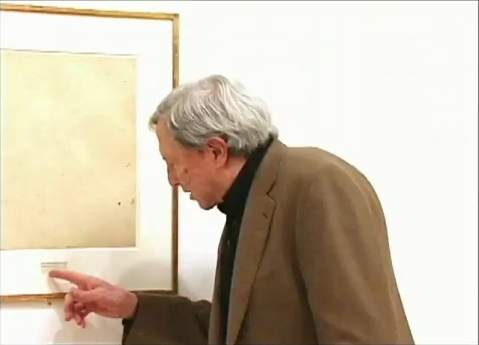 Tomkins may have been the first to publish it, but claim of Johns’ collaboration was first made at least six years earlier, by a seemingly unlikely source: Robert Rauschenberg. So when I titled it, it was very difficult to figure out exactly how to phrase this. And, uh, Jasper Johns was living upstairs, so I asked him to, to do, the uh, the writing. And they say you never get to know your neighbors in New York. Sometimes you make historic works of art together with them. Except that on Pearl Street, as Castelli famously told it, Johns was downstairs. And Rauschenberg was upstairs, in the loft vacated in the summer of 1955 by Rachel Rosenthal, who had found the building in the Spring of 1954. Rauschenberg was certainly around–and living around the corner–before then. They’d met early in the winter of 1954, began and he and Johns had already created and shown Short Circuit by then. So either Rauschenberg was referring to a time before they moved in together, Or Johns didn’t add his pieces to the drawing before mid-1955. Either way, it sounds like the drawing, to use Tomkins’ odd phrasing, actually “came into being” after 1953, the date Johns wrote on it. Part 6: A 3-Way Collaboration, that is, with Jasper Johns. Oh, that’s this post. Just one more, I think.